Recently Gartner Research VP French Caldwell (bio, blog, Twitter) grumbled a little bit in Twitter about poor AR practices by vendors he covers in the Magic Quadrant for Enterprise Governance, Risk and Compliance Platforms. This little tid-bit illustrates that analysts expect vendors to proactively reach out to them (for more background see SageCircle’s Hierarchy of Analyst Needs). If a vendor does not actively brief the analyst, then in the analyst’s mind the vendor gets what they deserve, whether a poor rating in research or even dropped all together from a research report. This research downgrade could have a direct impact on lead generation and sales as technology buyers (aka end users, typically IT managers for Gartner) often ignore vendors not ranked well in Magic Quadrants or other research. This is especially true when a competitor’s sales representative brings the vendor’s downgrade to the attention of a prospect. Another point this incident illustrates is that analysts are using social media to discuss their research agenda and make their displeasure about vendor performance known. Vendors that are not monitoring analyst commentary in tweets or blog posts could be missing important data points. Bottom Line: While vendor executives like to complain that the analysts need to “do their jobs” by proactively reaching out to request updates, the reality is that vendors need to be the ones doing the outreach. Question: AR programs – If you are on a Magic Quadrant or Forrester Wave, why do you not periodically brief the analyst? Hi James, Thanks for the thoughtful comment. I know how much boutique analyst firms hate to hear how influential that Gartner and its signature research like the Magic Quadrant are, but that is the case. And if something is so influential that — after publication — that a vendor would call up and complain about its placement, then it seems to me it would be worth investing in a miminum amout of effort of briefing Gartner analysts several times per year. I did a quick check of just some (will do more later) the vendors on this MQ and all seem to invest in PR. Maybe the ones who are not investing in AR need to reallocate some the PR budget into effective AR? Not going to be shy here. If I have an active piece of research underway as an analyst, it is incumbent on me to reach out to the key market participants…little bit of arrogance to expect the other way around, IMO. Analysts should do their homework. period. Everyone’s entitled to have a moan but to miss out a vendor on a whim should be generally agreed as unacceptable. Easy for me to say (you might say) as we don’t do product-based analysis or reporting, but the point on homework still stands. This isn’t a direct comment on Mr Caldwell, who I’ve never spoken to – apart from maybe pointing out the dangers of thinking out loud in Twitter. BTW, it is not just Gartner analysts that can’t do all-inclusive research, but also Forrester. (see https://sagecircle.wordpress.com/2008/07/09/why-analyst-relations-matter/). Because some analysts – for whatever reason – rely on vendor outreach, savvy vendors who invest in AR will ensure that analysts understand the vendors’s capabilities, market differentiation and customer success stories. Which will have a hard ROI in terms of lead generation from short list placement and sales deals not negatively impacted by uninformed analysts. Outreach, whether to industry analysts or the press or Wall Street – is a critical activity for any vendor. If a vendor doesn’t do effective outreach then they should not complain about poor results. For example, if a company does not do press relations, then in all likelihood it will receive far less — or no — coverage than a company that does effective PR. AR may be an essential outreach activity for vendors – but that does not mean that it is or should be essential activity for Analysts. 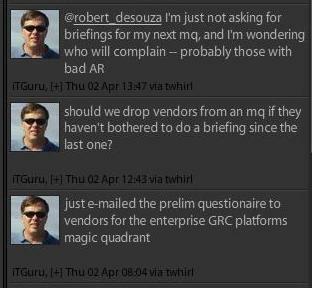 I have good relations with AR, but no vendor will ever be marked up or down as a result of greater or lesser AR outreach to me. My job as an analyst is to research – and I agree with Lyza & Jon above – the burden is on the analyst not the vendor. Carter, let’s start from the point of view that you may be right. There is a good case for relationship building in many areas of business, as in life. There. Shelved that. Now then. * Completeness. In the case of vendor research there will always be a thousand organisations which claim to solve the problem you are researching. The criteria you choose to determine which you include and which you leave out are of fundamental importance. * Evenhandedness. A second set of criteria concern how different vendors, once selected, can be compared. These criteria are also of fundamental importance, as they will directly influence the golden calf of AR – i.e. buying decisions. Get these two sets of criteria wrong and you undermine the quality and credibility of what you are doing. Or, to paraphrase, “Please find, herewith, a detailed and comprehensive study of those vendors who could be bothered to get in touch with me.” It just doesn’t work. Apologies if any of this is egg-suckingly obvious, but perhaps what’s missing from this whole debate concerns the interests of technology buying organisations. Analysts exist primarily to simplify the complexity around IT and help organisations make the right decisions. This is not always simple, and we can all vent from time to time. But let no analyst forget whose interests we represent, and act accordingly. Enough blame and responsibility to spead around: analysts need to make sure they are accessible (and some analysts’ accessibility is a challenge); vendors need to do more outreach between product launches and MQ/WAVE responses; and good AR people should plan out outreach activities and deepen relationships with analysts that satisfy both analyst needs and vendor objectives. i am sorry Rick, but the ultimate responsibility for the integrity and content of analyst output lies with the analyst. If there are valid reasons for gaps existing, then appropriate declarations can be made. Lack of proactive outreach from a vendor is not a valid reason for a gap or misinformation. 1. Vendor AR professionals who fail to outreach to an analyst who’s doing a major comparative report should take the blame for taking their eye off the ball, especially when firms publish their research agenda and calendar. Worst off, if you were included the year before and fail to outreach for a full year, that’s just shameful. 2. Analysts who fail to outreach to vendors who meet the eligibility criteria are just plain lazy. You should at least see what happened to the AR contact or the vendor. It’s common courtesy. Bottom line. It’s a 2-way street. However, its hard to second guess what French faced. It could have been a major vendor that met inclusion criteria but failed to do any outreach during the year. We’ve had that happen with AR teams that were overwhelmed or well, incompetent, or told by management to not brief an analyst b/c they were unhappy with them. As in many cases, the problem here is a breakdown in communication between the Analyst and AR. Quite simply, the Analyst is responbsible for providing the most thorough, objective and CURRENT research to its customers. By not doing this the Analyst is doing a great diservice to a paying customer base. In addition, the Analyst has devalued the MQ evaluation process. I also hope that they would get in touch with me before threatening such things over Twitter. The power dynamics in the vendor/analyst relationship are all screwed up. As a vendor, you pay to subscribe to the analyst service. Then you pay to brief them (either just travel expenses or more – some analysts even charge for the time you spend getting THEM smart). These briefings are held at THEIR convenience, as if you are sitting around with nothing to do. It needs to be a more equitable relationship. I agree that people need to brief, but as an analyst your job should be to provide unbiased coverage of the noteworthy firms in your coverage area, whether they pay you or not.